On-farm research offers many opportunities to understand the effectiveness of various management practices and products. However, how these trials are designed can alter the observed results. This guide summarizes the concepts of experimental design in vineyards and how those concepts are important in conducting field trials and understanding their results. It also describes specific examples of trial design and explains how to collect data relevant to vineyard research. Finally, the guide explains simple statistical tests that are used to help interpret results. Over the past couple decades, given the state of rapid growth in the New Jersey wine industry, viticultural and enological research has become increasingly important for local grape growers. The New Jersey Center for Wine Research and Education at Rutgers was initiated to facilitate the growth and development of the New Jersey wine industry by nucleating and coordinating broadly based research and educational programs. Such research initiatives need to be conducted state-wide in order to reach a significant sample size and produce meaningful results. Obtaining data sets from local vineyards can greatly help the center in identifying the needs of the New Jersey wine industry. It is highly encouraged that all wineries in the state contribute data to vineyard trials and document their experimentation so that industry needs can be determined and addressed. 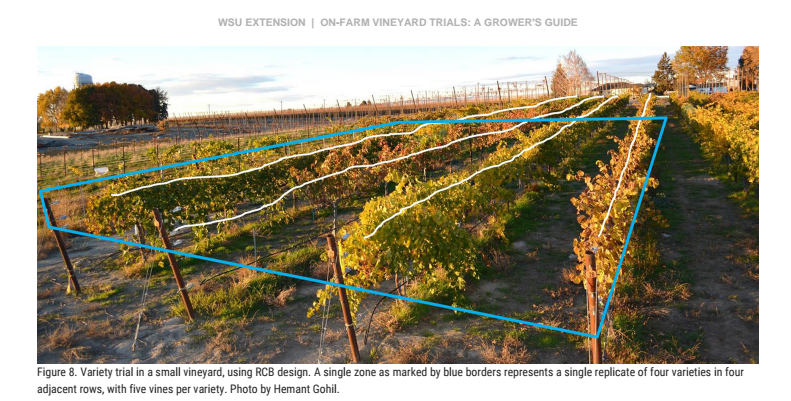 This guide, ON-FARM VINEYARD TRIALS: A GROWER’S GUIDE, is a valuable resource for evaluating new varieties, clones, and rootstocks. Other topics include how to evaluate canopy management practices, such as new pesticides and fungicides. For information about establishing a vineyard and pest management, see the Grape Growing page.